To get the smell out of shoes, I put a mixture of baking soda, baking powder, and cornstarch in a pair of cotton socks and stick in the shoes overnight. It works like a charm. 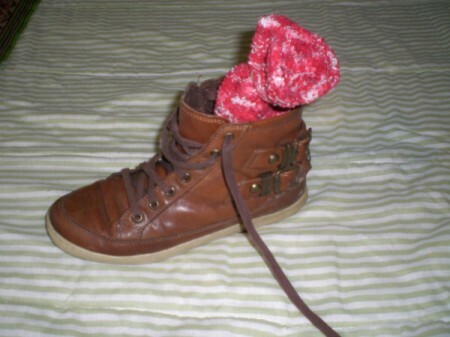 If you have someone who has sweaty feet all the time, here is a solution to get rid of the smell in their shoes. Throw shoes in the washer. Once dry, double bag them and put in the freezer overnight. Use regular kosher salt or any salt. Just sprinkle in shoes after heavy use, then wear with socks or without. It will kill the odor. Repeat if necessary. Want to get rid of the stink? Stuff the shoes with newspaper. That's right. Newspaper. Shoes should be "stink-free" come morning! Pour some cat litter, scented or unscented, into a pair of heavy socks or sock slippers and close it with a rubber band. Drop the litter filled socks into the pair of shoes or sneakers. Litter was created to reduce and remove some heavy duty odors, so it's perfect for this! Make shoe inserts from old socks. Stuff each sock with fiberfill or cotton from old pillow or stuffed toys, add a small amount of baking soda to help absorb odors, and machine stitch or hand stitch the opening closed. To get rid of smelly feet and stinky shoes you can use insoles made from cedar material. For example special Cedarsoles made from antifungal and fresh smelling cedar wood. It tackles the cause of the problem, foot bacteria!